Bradford Public Library is pleased to announce a new addition to our Library Services. We have recently purchased a telescope through the Stillwater Stargazers Astronomy Club that our patrons can now take home with them to enjoy! This telescope has been specially altered to make it user friendly and less likely to break. 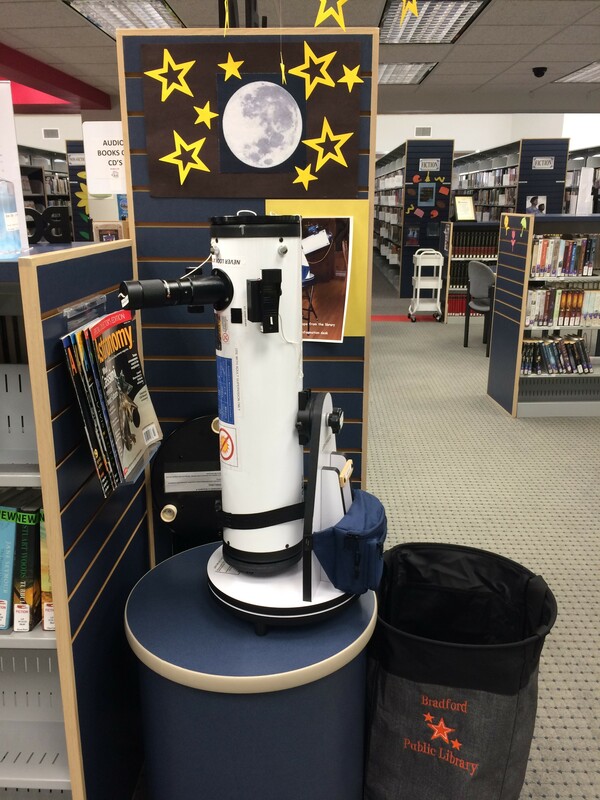 Those wishing to borrow the telescope will need to have a valid Bradford Public Library card, a current photo ID, be at least 18 years of age, and will be required to sign a borrower’s agreement. Come in to see a copy of the entire agreement. Telescope can be checked out from Monday after 12:00 noon and returned by Thursday before noon, OR can be checked out Thursday after 12:00 noon and returned no later than Monday before noon. We anticipate many of our patrons wanting to use this awesome new service so be sure to come in to get your name on our reservation list. Patrons may reserve the telescope for a specific date if they wish for a special occasion or family gathering, or special night sky event such as the recent Perseid Meteor Shower. Next time you stop by, be sure to take a look at the newest member of our BPL family, it is currently on display by our New Books section!